This is Pinpresso documentation (more on this product here). You can skip the documentation with our 24h theme installation service. Whether it’s your own website or a client's, we can take the burden of installation off your shoulders. Theme installation includes full setup of the theme, plugins, settings, and demo content. Your website will look just like the demo within a few hours! 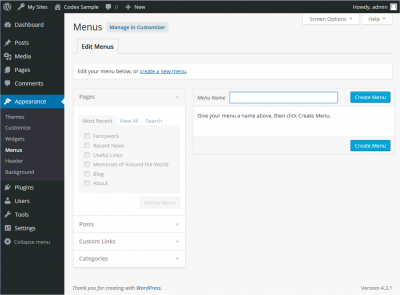 Pinpresso is a Wordpress theme, so you must install Wordpress first. There are several ways to install WordPress but the easiest way would be to use one of the one-click autoinstallers available from you hosting company. Click here to learn how to install WordPress with the most popular autoinstallers, WordPress Toolkit, Cloudron, Fantastico, Installatron, and Softaculous. Log into your site as an administrator. Make sure the theme and all required plugins are active before proceeding. Read the previous chapter to learn how to do that. Go to Tools → Import. Choose “WordPress” from the list. Upload this file (download it first to your computer). You will be asked to map the authors in this export file to users on the blog. Choose an existing user. You will then have the choice to import attachments, so click on the “Download and import file attachments” box. Wait while WordPress imports everything. That’s it! You’ve just created a custom menu. Now let’s add some items to it! Great! Now the final step, make the menu visible in site. “Pinpresso” theme has 1 menu locations: main menu. In the section titled Theme locations, click the check box for the Main Menu box. The menu should be now visible in website. “Pinpresso” does not have a complicated layout. Basically, all you have to do is post. The post cards will nicely arrange in their order. However, you have the option to set the number of columns per raw. To do this, navigate to Appearance/Customize/Layout - Masonry Layout. “Pinpresso” has a special page profile for each author. You don’t have to do anything, these pages are created dynamically for each author. Example. If you want to show a list of all website’s authors, create a page, name it “Authors” (or whatever you like), and assign it to Display Author template from Page Attributes, then publish. If you don’t need this option, you can disable it via Appearance/Customize/Pinpresso/Logo & Nav Area. Simply toggle off the user menu area. If you decide to keep the User Account menu, read on. The Sign in & Create account links come from the free plugin Ajax Login & Register, so make sure first you have it installed and active. A detailed documentation about this plugin can be found here. To set the Account Page, make sure you have the free plugin WP User Frontend installed and active first. A detailed documentation about this plugin can be found here. Actually it’s not just a newsletter alert bar, since you can add anything you want to it. Pinpresso demo uses it as a newsletter area. The shortcode for the newsletter form can be obtained through your newsletter plugin. The example shown in screenshot is using Mailchimp for WordPress free plugin but you can, of course, use your own newsletter client. Contact us if you need help styling it. “Pinpresso” is integrated with the free plugin Favorites. What does this mean exactly? Whenever a visitor/logged in user clicks the Favorite button, that specific posts is added for them in a special page where they can access it and read later. To create the “Favorites” page, add a new page, name it Favorites or Bookmarks (or whatever you like) and assign it to Users Favorites template from Page Attributes, then publish. Demo Example. Remember to click “Favorite” on a post first. “Pinpresso” is integrated with Rate my Post free plugin. This means users can rate your post/product. “Pinpresso” is integrated to Add to Any free plugin. This means users can share your posts from the post cards or from the post itself. The reason behind this approach is making the publishing experience for your guest/users as smooth as possible. Your visitors can post as a guest or as registered users. We wanted to provide a quick ajax sign up in order to keep your potential publishers on the website. “Pinpresso” is compatible with the free plugin WP User Frontend to serve your possibility of allowing guests/users to publish posts on your website. Make sure you have the plugin installed and active. Follow the set up process, let the plugin create the necessary pages. A page named Edit with the shortcode [wpuf_edit]. A page named Login with the shortcode [wpuf-login]. 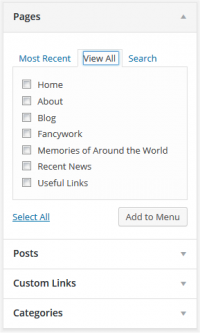 Now that you have completed the settings, let’s create a the “Publish a story” page, where your guests/users will actually publish their posts. Navigate to Appearance/Frontend/Forms. Create a form as shown in the screeenshot below and copy the generated shortcode. Paste the shortcode in a newly created page called Publish a story (or whatever name you wish). That’s it! This happens. Post SMTP plugin will help you fix this issue. It has a powerful Setup Wizard for perfect configuration to send e-mails through your WordPress website. “Pinpresso” is compatible with the free plugin Easy Digital Downloads. To enable the digital shop on your website, make sure you have this plugin installed and active. To add your products, navigate to Appearance/Downloads - Add new download. Your shop with the newly created products will be at: www.mywpwebsite.com/downloads. EDD is a great, simple yet fully featured plugin. A special extended documentation of the EDD plugin can be found here. "Pinpresso" theme is translatable. All you have to do is to install a specific plugin so you can easily translate the theme in your own language. We recommend you Loco Translate plugin. "Pinpresso" documentation is always evolving. If you have questions, please, submit a ticket here. Also, don't forget to subscribe for news, updates & releases!